This contribution to the history of the Lion House in Castle Street, Thornbury is based on deeds belonging to Phyllida Parsloe, to whom the Thornbury Museum Research Group owes much gratitude. We are also grateful to Roger Howell an archaeologist and local historian who has examined the deeds and produced the information shown here with only small additions from ourselves. Thanks are also due to Meg Wise and Heather Palmer for their valuable suggestions and contributions based on their wide knowledge of the topography and genealogy of Thornbury, and also to Rosemary King of Alveston who generously communicated the results of her extensive research on the Rolph family. The deeds and documents studied here range in date from 1818 to 1936 but some of them refer to earlier deeds reaching back to 1767. The name “Lion House” is of fairly recent origin but for the sake of clarity we have put inverted commas round the name for the periods before it came into use. The text is divided into chronological sections which relate to the families or individuals who were the owners of the property at the time. The house is said to have been extensively rebuilt by John James, the veterinary surgeon who bought it in 1883, although it is noticeable that the descriptions of the house in the various sale documents are remarkably like today’s building. 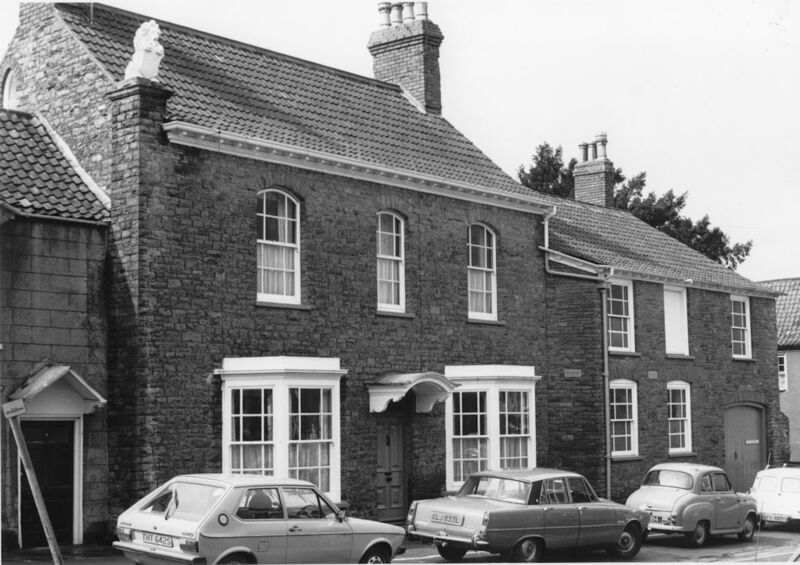 Prior to that it had an interesting and varied history which included being a pub called “The Black Lion” which gave the house its present name “The Lion House”. The earliest owner of the house to be mentioned in the deeds of the property is George Rolph senior. However we know that the Rolph family although they owned this house probably did not live there, or at least not for long. The assessments for the poor dated 1769 and 1770 seems to confirm that Hugh Cleverly was a tenant of George Rolph and that 1d tax was payable on a property referred to as “Shipleys”. We have an earlier reference to “Shipleys” in the Assessment of the Poor Rate of 1751″. “Lion House” may have been owned by Thomas Clark and so became part of the marriage settlement of George and Sarah. We believe that the widowed Cleverley referred to in the indenture of 1768 may have been Sarah Cleverley who was buried on 30th July 1780 aged 75. Sarah was described as the “relict of John Cleverley”. John Cleverley died aged 56 on 2nd November 1765 in Thornbury. This would explain why in 1768 the widow Cleverley occupied the property now known as Lion House. We do not know the relationship between Hugh Cleverley and Sarah and John Cleverley. Probably he would have been their son. We note the baptism of Hugh Cleverly on 3rd September 1746 in Heddington in Wiltshire. His parents were John and Sarah Cleverly. Hugh Cleverley (or Cleverly) married Anne Pritchard on 31st March 1768 in Thornbury. The witnesses were William Greenwood and George Whitfield. Anne Pritchard was baptised 6th May 1739 and she was the daughter of Solomon Pritchard and his wife Hannah or Anna nee Barton. Hugh and Anne Cleverley suffered several bereavements early in their marriage. Their first daughter Sarah was baptised on 18th January 1769. Sadly she died and was buried on 31st August 1769 aged only eight months. Another daughter called Sarah died as an infant and was buried on 26th May 1771. The baptism record of their third child Betsy on 2nd September 1772 has some additional interesting information. The occupation of Hugh Cleverley was a “gardiner.” It is also interesting to note that by this time the couple had moved out of Castle Street and their address was now Moreton Mill. Their fourth child was a son called Hugh who was born 28th February 1774. The second son to be baptised by this couple was John and he was born on 3rd May 1776. We believe it is possible that some time after Hugh and Anne Cleverley had moved to Moreton Mill they may have left the Thornbury area altogether. On the Ancestry website there is a record of the death of “Anna Cleverly” the wife of Hugh Cleverly at Stoke Newington in London on July 20th 1796 aged 58. The Access to Archives website shows that the Hackney Archives department has two documents relating to land in Stoke Newington. One, dated 30th May 1807 (ref M547), is a lease to Hugh Cleverly a gardener of Stoke Newington of two acres of land at Newington Common for building a house. Another is an abstract of title dated 1828 (ref M3892) and refers to a house in Stoke Newington occupied by Hugh Cleverly. It seems that Hugh built his house as he intended. Ancestry also has a record of the death of Hugh Cleverly, a gardener, aged 64 on January 3rd 1811 aged 64. Rebecca Horton. By 1780 we know that “Lion House” was tenanted by Rebecca Horton. It is noteworthy that the property still seemed to be referred to as “Shipleys”. Mrs Horton was a tenant in the land tax records until at least 1784. We don’t know when she left the “Lion House” but there is a reference to a will on the internet which might have some relevance. The will of Richard Hankins of Lyons Inn, in Middlesex proved 24 Dec 1785 left to Mrs Rebecca Horton of Thornbury in the County of Gloucester widow “my estate in Broad Street, Bristol (parish of St Philip & St James) plus the interest on £1000 Stock in the Centurion Bank Annuities for life”. The Bath Chronicle of 10th April 1800 had an announcement of the death in Thornbury of Mrs Horton the widow of Captain Horton. She was said to be in her 94th year. We know more about the owners of the house who are referred to in the deeds. Please click on the links below for further information.